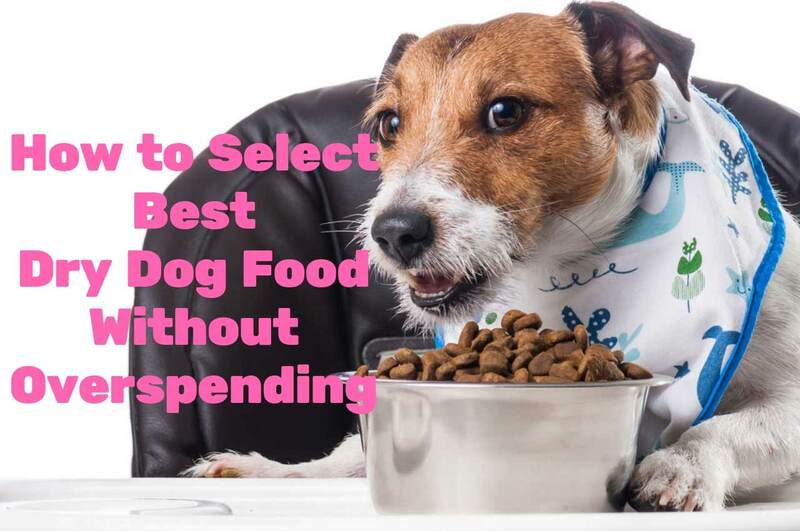 How to Select Best Dry Dog Food Without Overspending? ​Even though dry dog food has multiple advantages over fresh or canned food, and it preferred by dog owners and veterinarians alike, it is not always easy to pick out the best dry dog food for your canine companion. With a multitude of options, most owners imagine that there is one type of dog food that will be a head above the rest, but that is not the case. Multiple factors contribute to how your dog will digest the food you give it, including its size, weight, age, and the type of food they used to eat. You might want to make a personal list of dry dog foods that are beneficial to your pet and then switch between different products, depending on the situation. If you own a small dog, feeding requirements will not be an issue as they will eat considerably less than any other member of your household. But, if you own a large dog this can become a problem as the metabolism in dogs is about twice as fast as those in humans due to the higher muscle concentration and a mostly carnivorous diet. In these cases, you will want a high-quality primary source of protein that is also cheap. For fresh meat, this will depend on the region you live in, but for dry food, you will have several options including chicken, beef, lamb, and pork. In the best dry foods, these ingredients will be mixed with supplements and additives that will assist your pet in getting the most out of this protein. Dietary variety for pets has been shown to be crucial in their development and long-term health, as multiple problems can arise from feeding your dog with one type of protein exclusively. Aside from the canine probably not getting a sufficient variety of nutrients and oligo-elements, there is a possibility for the dog to develop allergies to the particular type of protein, damaging their health until you realize the mistake. With dry foods, this problem is solved very easily as there are multiple brands that offer novel types of protein from turkey to venison, to bison meat. These types of novel protein will not only have a very positive impact on your dog's health but will also be very tasty, for which your dog will thank you. Aside from the two most prominent ingredients in dry dog food, which are protein and fatty acids, the best dry food brands on the market offer additional supplements and vitamins inside the food ensuring enzyme creation, as well as the introduction of antioxidants and elements that will improve skin and coat quality of the animal. Some product will contain additional glucose sources such as rice, as to make these supplements digest easier for some dogs, but if you have a larger dog, it is usually better to acquire dog food that doesn't contain any filler. You should avoid products that contain any substantial amount of wheat, grain, or corn, as these ingredients may be harmful to your pet. It is important to emphasize that there is no such thing as the best dry dog food, as there is no such a thing as the best dog. What you should be looking for is a small number of tested options that will benefit your dog in particular. Portrayed are the best brands the market has to offer, that are both tried and tested as well as budget friendly. If you know which type of food is best for your dog, as well as which kind of protein your canine companion prefers, you will undoubtedly be able to find your dog's next favorite food in the list below. 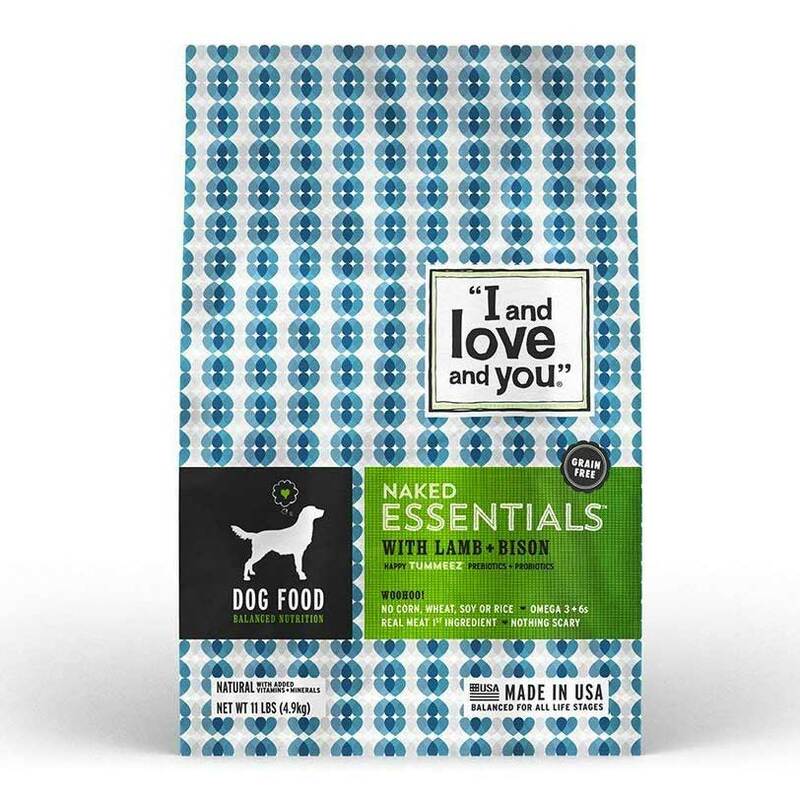 Although I and Love and You offer several options for this line of dry dog food, probably the best option is the one mixing white lamb and bison meat, as this is a perfect choice of novel protein for those who have not yet fed their dog with these ingredients. 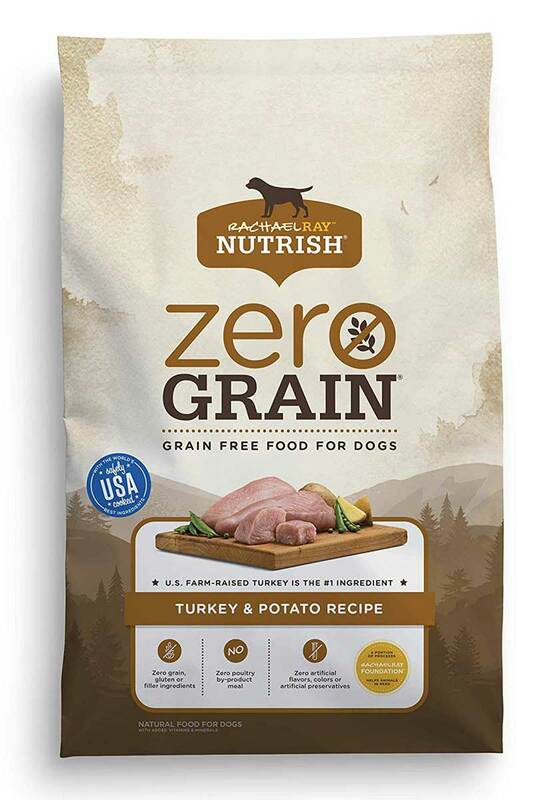 The product is grain free both as a general ingredient and as meat filler and has a high concentration of protein, making it a good choice for pups of all ages, but are exceptionally beneficial for young and adolescent dogs. One of the probiotics is Lactobacillus, which can be a significant issue for dogs that are allergic. If you have an older dog that both large and active, the Purina formulae might be just the thing for you. Unlike lesser brands that usually use corn or wheat as a filler, the Purina Beyond includes whole grain which can be helpful for older dogs that spend a lot of time outside. 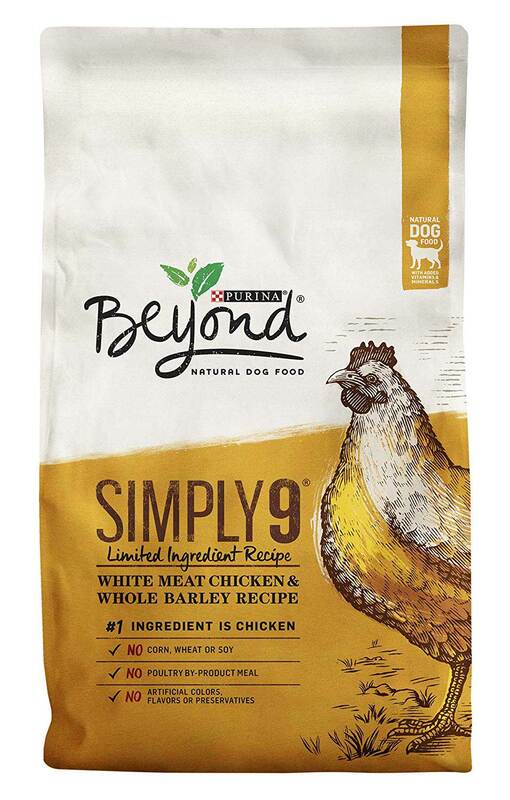 The main ingredient of this food is chicken, which can be either a great advantage or a deal breaker depending if your dog can take in common protein. If you have a healthy dog, this will be an excellent way to keep it that way up to their old age. 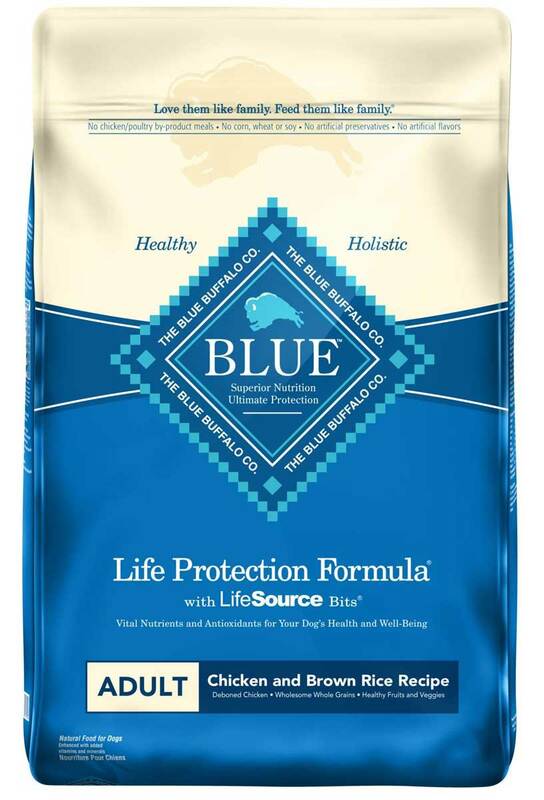 Blue Buffalo is one of the best brands on the market, and their dry dog food is considered to be a treat for most pets. 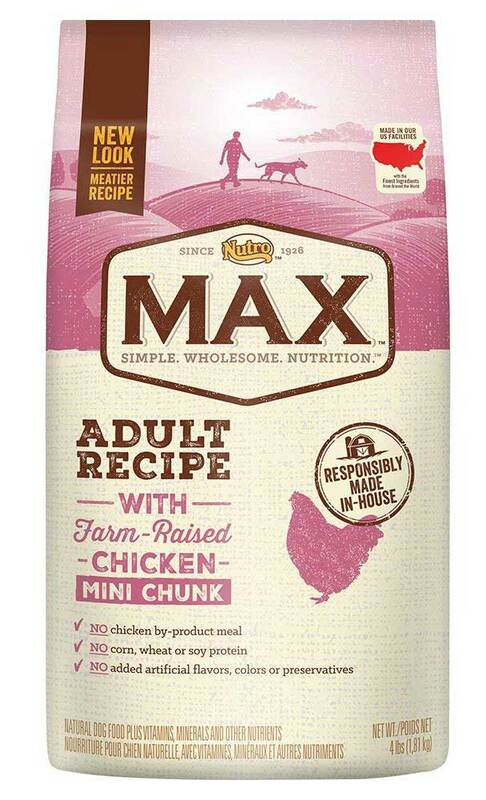 This formula with brown rice and chicken is a good overall solution for adult dogs that have a lot of muscle mass and thus need a lot of protein in their diet. The greatest advantage of Blue Buffalo kibble is that it contains real meat that is not as processed, as usual, making the nutrients stay virtually intact. Although, because of this lack of processing, it is advisable to purchase smaller batches as this brand is much more perishable than it is common in dry food. 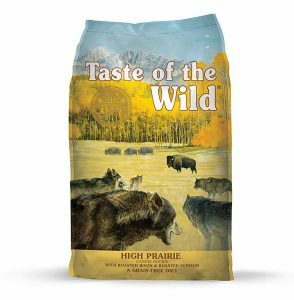 As there are plenty adult dogs that have become allergic to common protein, Taste of the Wild has created kibble that is based on a novel protein that will keep your dog healthy and active for a long time. Bison and venison are not only uncommon for most canine diets, but are very protein rich and will ensure a good muscle tone. The product also contains omega-3 fatty acids, as well as probiotics, vitamins, and minerals, creating a perfect nutritional mix for dogs of all sizes. Some dogs are notoriously picky with their food and will not eat food that has even secondary additives that are not placed in the formula but the meat itself. That is why Nutro Max has made a GMO-free kibble that will satisfy the appetite of even the most pampered dogs. Additionally, this is one of the most affordable dry dog food types on the market, meaning that you will not need to break the bank by feeding your canine companion. This formula doesn’t contain any wheat, corn, or soy, but it does include brown rice and peas, making it better for older dogs than for puppies. 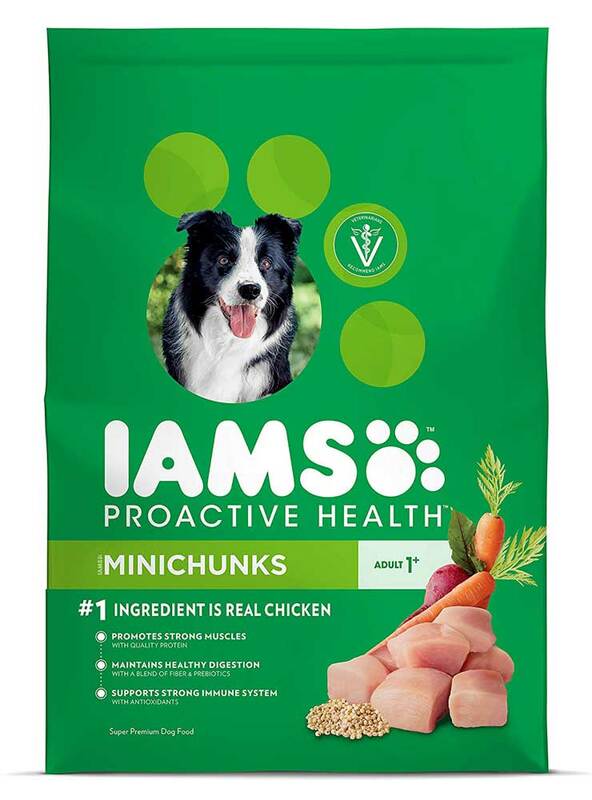 The IAMS Mini Chunks are one of the best all-around options for most adult dogs, with a perfect balance of protein, carbs, and additional nutrients that will help prolong the healthy like of your four-legged friend. With the introduction of L-Carnitine, your dog should have their metabolism improved, making them more energized and active. Although this formula has a considerable amount of protein, whole grain and beet pulp make a significant part of the kibble, making it inadequate for dogs that are allergic to this sorts of ingredients. While most are familiar with the celebrity chef, Rachael Ray, not everyone knows about this excellent kibble that is a contender to be the best dry dog food on the market today. While there is a variety that is based on salmon, as some picky dogs avoid fish it is reasonable why turkey is more popular and regularly used. This dog food is specific for many reasons, mainly because it has no common protein contents, as well as only trace-amount of carbohydrates. As the only meat source in this kibble is turkey, the only byproduct is turkey meal, which doesn't induce allergies to dogs which are unable to eat common protein such as chicken or lamb. If you have a puppy or a younger dog, this product will be perfect for their development, and if you have an older dog, it will give them much more energy. Be careful, as this is a protein-rich compound, it is easy to overfeed your older dog, making it gain come unnecessary pounds. ​Turkey is the most common novel protein, and it is possible that your dog has developed allergies to it. If you were ever to taste this kibble, you would find it to be very neutral. As there are no artificial flavorings or colors, this dog food doesn't have the familiar smell you would expect, but rather a neutral earthy scent. This is very important for dogs that have a sensitive digestion and don't want to eat other foods. For these dogs, this is the best option as the formula is rich in protein and will keep the dog’s muscle mass on a good level. 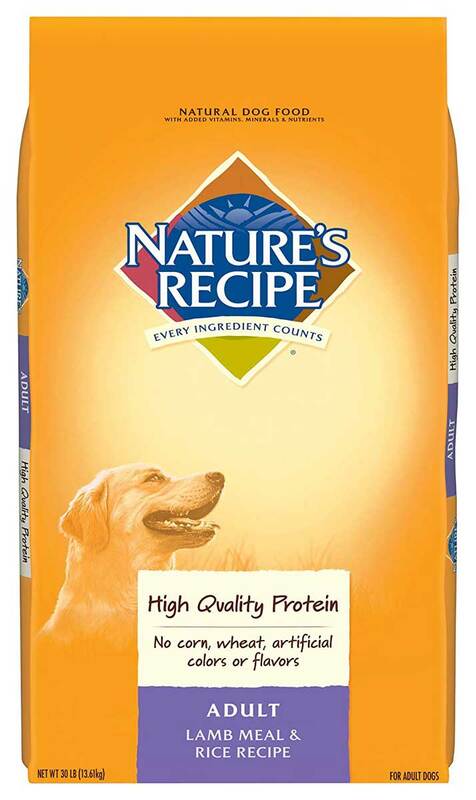 As the second ingredient in Nature’s Recipe dry god food is barley, it will not pack enough of a punch for growing puppies, but it will be more than enough for older dog’s that still want to run around and play. As you may have noticed, one of the biggest problems when trying to find the best dry dog food for your pet is allergies, as more and more dogs develop them due to the environment. If your dog shows any signs of rejection to food, exchange their diet immediately and introduce new types of protein or kibble that doesn't have the same vegetable mix inside. Additionally, while all of the products from this list are protein-rich, some might have significant amounts of carbs, making them unsuitable for young dogs. Finally, you should remove any wheat, corn, or soy from the dog’s diet. While you will notice that some dogs actually like eating bread, this is usually due to the lack of salt and other minerals than to their dietary preference. Once you have worked around all the problems and have selected the best kibble for your dog, you can focus more on playing with the dog and taking long walks, than at your canine companions dietary needs.